Welcome to our water heater FAQ’s page. Below are the questions most frequently asked by our customers when they are having trouble with their water heater. There is a little puddle underneath my water heater, what does this mean? Usually if there moisture anywhere on or around the water heater is means you have a water leak. The type of the leak coming from the water heater will determine if your unit can be repaired or if it will need to be replaced. 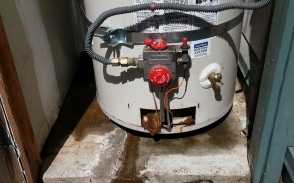 If there is a large puddle at the bottom of the water heater or water gushing out, most likely your internal tank ruptured and it will need to be replaced. Follow our emergency shut down instructions or give us a call and we will walk you through turning off the water heater. Got another leaking water heater FAQ give us a call and speak to one of our water heater experts to get a clear precise answer. I have not hot water, what is the problem with my water heater? If you turn on your faucet and you have no hot water and there is no water leaking from your water heater, most likely your pilot light has gone out. We have noticed that the new style sealed water heaters tend to be much more sensitive to air flow and the pilot light will go out more frequently that the old style open chamber water heaters (hint: if you need to reach inside the water heater with a match or lighter to light your pilot it is an old style water heater, if you have button that clicks to light your pilot on the outside of your water heater it is a new style unit). Try to follow the pilot lighting instruction on the front of the water heater and see if you can get the pilot lite. If you have problems lighting the pilot on your water heater give us a call 925-945-6619. My hot water is lukewarm, it doesn’t really get hot like it used to? If it feels like you’re running out of hot water or your water doesn’t get really hot, your water heater may be experiencing problems from sediment or a malfunctioning part. A good way to test for sediment is to drain your water heater and see if any debris or small rocky like matter comes out with the water. If is does then water heater is starting to get sediment build up that is keeping your water heater from fully heating up. Another sign of sediment build up is a rumbling or banging noise coming from the water heater when it is heating up. That is a sign that the sediment has hardened to the tank, unfortunately draining the water heater doesn’t usually help at this point. You may need to have the water heater professionally drained or replaced to remedy this issue. If you have a newer water heater and you notice that the water just doesn’t get as hot as it used to and you have already checked to make sure that no one else in the home has adjusted the thermostat, you may have a malfunctioning part. Depending on the age of your water heater, you may have warranty coverage for you replacement parts. If you can find the model number and serial number on your water heater before you call we can valid the age and tell you know if there is any warranty for your parts. If it is still covered under a warranty we can try to warranty replace a part or give you the information on how to obtain a part under warranty. Are tankless water heaters worth the money? If you are considering changing your old water heater and going with a tankless water heater, we recommend you do a little research to make sure a tankless is right for your household. 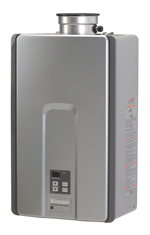 Tankless water heaters offer a compact choice for water heating. they save a small amount on the energy bill, but usually just enough to pay for them selves in the long run. Tankless water heaters can produce an endless supply of hot water, but are limited in the amount of flow they can produce at one point in time. I you have high water usage in your family and it all happens around the same time, ie you have a few hot water fixtures in use all at once, a tankless water heater may not keep up with the demand. Making sure a tankless water heater is sized properly is one of the most important factors in making the choice to go tankless. Other energy efficient water heating options are available today that can save even more in energy, but nothing is a space saver like a tankless water heater. If you have a water heater FAQ that is not answered here feel free to visit our main Water Heaters Only, Inc Frequently Asked Questions page or call 24 hours a day and speak with one of our water heater experts (925) 945-6619 to answer any water heater FAQ you have.